With over 30 years experience in supplying Boss aluminium scaffold towers and ladders to the construction industry, RK Access can offer expert advice to help you make the right choices to suit your needs safely and at the best possible price. RK Access supply only genuine Youngman BoSS access equipment which includes the full range of BoSS scaffold towers, podiums, Youngman ladders and steps. We supply direct from the manufacturer to you, no third party handling. The latest system from Youngman. 100% compatible with BoSS Original towers. Robotic welding and Laser cutting technology. The best tower system available. Rapid and safe assembly by one person. Three platform heights available up to a maximum working height of 6.2m x 700mm wide x 1.3m long. The new Cam-Lock AGR (Advance Guard Rail) system is a one piece frame assembly that is attached prior to the operator ascending the platform, thus providing protection by guard rails at all times. The worlds premier Glass Reinforced Polymer GRP (Fibreglass) Industrial modular access tower system. Boss Clima is an aluminium tower system which incorporates climbing frames with 250mm easy climb rung spacing offering an alternative frame configuration. All Boss tower components are available to buy as individual units. Invaluable when damaged or lost components need replacing or to add to existing scaffold equipment for increased tower height and flexibility. RK Access carry a complete range of Boss Additional components to enhance your tower system to safely overcome most access problems and awkward areas. The Youngman BoSS Confined Space/Liftshaft scaffolding tower uses standard Boss aluminium frames but is only 1.3m long. Ideal for Liftshaft installation and maintenance or for use in restricted areas where standard length Boss scaffold will not fit. 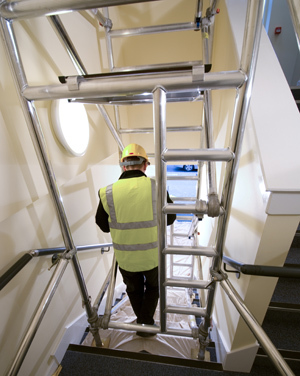 The ideal scaffold system for use on domestic and commercial staircases. The Room mate scaffolding tower is a folding base unit tower which can be built up to 6.05m Platform height,8.05m safe working height. The latest Boss Stairway tower featuring the unique Multiguard Advanced guardrail with Camlock locking claw. Available in 1.8m and 2.5m lengths. Advanced guardrail method of assembly ensures complete protection at all times. The Minimax is a heavy duty aluminium folding base system for professional and frequent use. The Minimax tower is availabe with additional extension packs which enable platform heights of up to 5.8m to be built. WE WILL ALWAYS DO OUR VERY BEST TO OFFER YOU THE BEST POSSIBLE DEAL ON ALL YOUNGMAN PRODUCTS. FOR THE BEST PRICES PLEASE GIVE US A CALL BEFORE YOU BUY. Prompt FREE delivery on all orders over £395 to most of the UK Mainland. Please contact us for details. 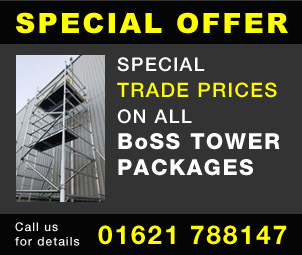 COMPARE OUR BOSS SCAFFOLD TOWER PRICES!